A team of researchers from the University of Rochester has managed to levitate nanodiamonds in a vacuum using laser light for the first time—which could provide a new breed of microscopic sensors. It’s not the first time scientists have used laser light to levitate nanoparticles. But what’s different this time is that the nanodiamonds are optically active: they contain nitrogen-vacancies that can emit light, which means they can actually do something while they float in space. The scientists first performed experiments levitating the nanodiamonds in air, as shown above, before tweaking their set-up so that they could do the same in a vacuum. In air, the microscopic particles are bombarded with molecules which makes it hard to keep them in place. In a vacuum, those effects are removed. “This allows us to exert mechanical control over them,” explains Levi Neukirch, the lead researcher behind the study, to PhysOrg. The research is published in Nature Photonics. By constantly measuring the tiny movements of the particles as it sits in the vacuum supported by the laser, the team can adjust the intensity of the light to ensure it stays in place, moving by only tiny amounts. 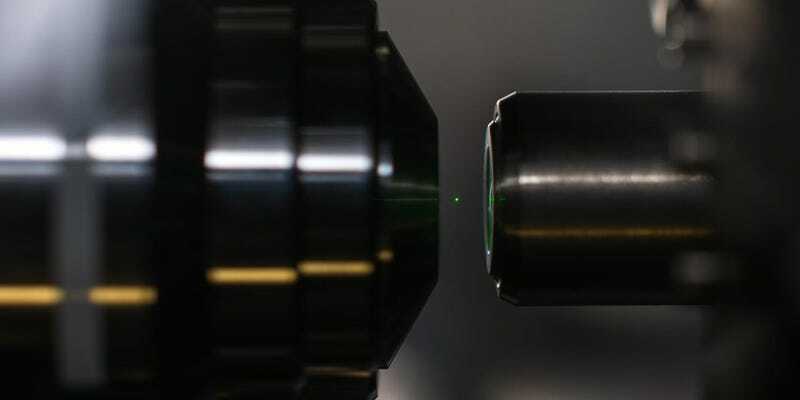 One laser is used to excite the nitrogen-vacancies which in turn emit light; that provides the researchers with the information required to tune a second laser which traps the nanodiamond, levitating it in the vacuum. While the work is progressing well, the researchers hope to reduce the oscillations of the nanodiamonds to virtually nothing—the so-called ground state. But right now, that involves using temperatures and pressures that destroy the nanodiamonds. Still, the systems should prove useful regardless. The relative lack of movement means that the nanodimaonds could be used to measure extremely tiny forces or torques: even tiny forces will moves the particles very slightly, and the emitted light from the nitrogen vacancies should provides a means of measuring them. It’s like a tiny set of weighing scales—one that should only get more accurate with time.